SUMMARY: When a large asteroid hits the moon, knocking it closer to earth, global climate disaster ensues. As things go from bad to worse to bleak, Miranda and her family struggle to survive and stay healthy and together. REVIEW: Several years ago, I read The Dead and the Gone, which is the story of a boy (Alex) and his two sisters who live in New York City when this moon disaster strikes. 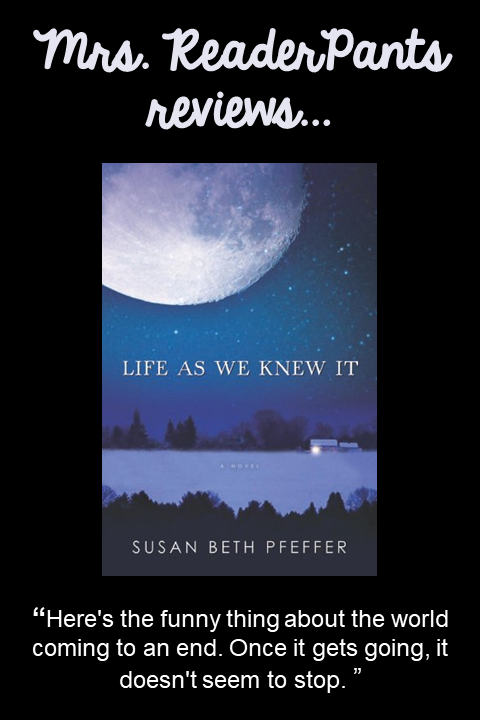 I have always wanted to read Life As We Knew It and finally got around to it! I devoured this book! The aftermath of the moon asteroid makes sense in its slow progression from power outages and gas shortages to grayed-out skies and food and water shortages. I don't know if the science of the moon asteroid really works, but it sounds believable enough to me. As with The Dead and the Gone, this book makes me want to stockpile canned goods and water. Considering the present state of our pantry, I doubt my family would be able to survive this situation the way Miranda's does. Told via Miranda's journal entries, Life As We Knew It underscores love and sacrifice for family throughout the book. Miranda's mother is an incredible person who is a smart survivor who does everything necessary to ensure her family's safety. She gets frustrated at times, but she certainly deserves to be. I also love how Miranda's divorced parents make a genuine effort to get along, even though Miranda's father has remarried and has a new baby on the way. Miranda's mother opens her home to them and buys new clothes for the baby and is really one of the strongest parental characters I've ever seen in a YA novel. Miranda's journal entries sound just like what a teen girl might be thinking during this time. She fights with her mother, doesn't understand how life can be so unfair, experiences fear and hunger and survivor's guilt. As the book progresses, some of Miranda's friends leave, some die, and some just disappear. Miranda's thoughts about her situation reminded me many times of The Diary of Anne Frank. So now I am ready to read book 3, This World We Live In. I am uber-excited for this one because it brings Miranda and Alex (from book 2) together and mixes in some romance! Can't wait! THE BOTTOM LINE: I'm sure most middle school libraries already have this series, but if yours doesn't, you really should see about getting it. Fantastic writing that will be a huge hit with the survivalists out there. STATUS IN MY LIBRARY: We have the first three books and Shades of the Moon (#4), is on-order. Great review! And a book dealing with love and sacrifice for family! I'm glad to have found this one. Thanks!